The Luthiers over in the camp of Taylor Guitars, are undoubtedly two of the most well respected and regarded by the industry as some of the Best Acoustic Guitar Luthiers today. In this case, Bob Taylor and Andy Powers are the makers of some of the finest American made acoustic guitars. 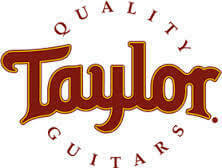 And as such, after celebrating 40 years of building quality instruments Taylor Guitars are in more demand now by most players that it ever has been. It isn’t just about developing new instruments from wire and wood or sticking a pick-up in a guitar body. Bob Taylor and Andy Powers constantly push the boundaries of the manufacturing process and building techniques whilst exploring the different methods & materials for making guitars. As I said these two individuals are now among the most highly admired and respected luthiers in the industry. Their efforts are helping the company to become a big instrument manufacturer with wide-reaching distribution, with the main factory in El Cajon California. The other is in Tecate Mexico (where the less expensive models are made.) Also they have a warehouse in the Netherlands as to better serve the European market with. 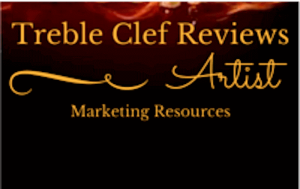 With a growing list of accomplishments and accolades. 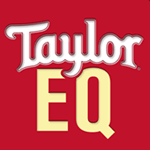 There has been a constantly increasing popularity with Taylor Guitars in the music industry. So much so that now it’s not uncommon to see mega stars recording and performing with these acoustic guitars. So without any further adu below is an overview of Bob Taylor and Andy Powers. As it is the case with many great acoustic guitar luthiers, Bob Taylor, the co-founder of Taylor guitars, started out early. Before founding Taylor Guitars, he used to work at a guitar making shop called “American Dream”. Through a lot of trial and error when working in the guitar store, he picked up what worked and what didn’t. Even before starting to work at the American Dream guitar shop. He used to build his own instruments with guidance from his high school wood shop teacher. When Sam Radding (the then owner of American Dream) decided to sell the guitar shop, Bob Taylor and his partner, Kurt Listug bought the shop and renamed it “Westland Music Company”. The name was later changed to Taylor Guitars. With dedication and plenty of hard work Taylor Guitars has managed to grow into an innovative company today. 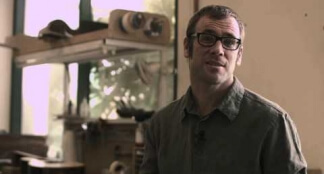 With his do-it-yourself attitude, Taylor resorted to developing his own tools for making guitars before adopting the modern guitar-making-technologies and machines such as the laser cutter. Different from many other luthiers who believe that the guitar making process should involve only 5-7 tools, Taylor believes that fixtures, processes, machine tools and machines are tremendous in the life of anyone that is trying to make anything. According to Taylor, technology enhances one’s ability to be very creative. In this generation, luthiers don’t have to give up on any of their ideas just because there isn’t a hand tool that can be used with the traditional methods to execute it (the idea). Using modern technology together with the traditional methods of making guitars, Bob Taylor has been continually creating Taylor custom guitars in this fashion. Andy Powers is now the new master builder of guitars at Taylor Guitars. For many years, Andy has been building his personal line of custom acoustic guitars whilst repairing high-end classic models (andypowersinstruments.com). He is an upfront and down-to-earth guy. Like many other creators of American made acoustic guitars, Andy Powers is a very good player with so much love for the guitar, that he wants to build them. Even though his father was a carpenter, he didn’t formally study luthier; he rather consumed a lot of literature about guitars, deconstructed old & broken guitars up to when he learned what made them (the guitars) work. He was convinced by Bob Taylor that the world of guitars and music would be better when both of them are working together. The big idea was to be a company that lives past its namesake, whose purpose for existing is to support the craftsmanship as well as the musicians that they love whilst continuing the tradition of being a luthier. The relationship between Bob and Andy is really rewarding. This is because both of them in many ways, as guitar makers and designers, think similar. Even though they have a real similar outlook on things, they are still able to bring out each one’s unique strengths into their relationship. Andy comes at the guitar both as a builder and player with a repair & restoration background. Since he possesses a lot of experience with antique instruments and many different types of instruments including pianos, violins, mandolins, arch-top guitars and many others, he brings in a somewhat broad perspective into his guitar building. On the other hand, Bob has an incredible machining which can, due to lack of better words, best be described as implementation. He can take a thing and figure it out; for instance, how to build something 1000 times over while maintaining the good and/or high quality of each of the products. Bob Taylor and Andy Powers have a best-friend working environment. The guitar player benefits from that environment as he/she gets the product of so much experience from different ways built into that one instrument. 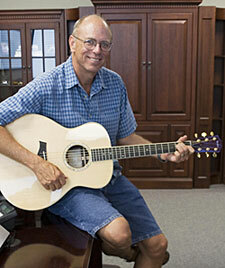 With Bob Taylor working with Andy Powers, expect the best American made acoustic guitars from Taylor Guitars. And now by using Taylor Guitars new solid body configurator, guitarists can also design their own custom acoustic guitars of their dreams. Hey Yunier good to see you made it. Yea they really do have awesome guitars, I have a couple myself I use on different pieces of music. My percussionist’s daughter decided to learn how to play guitar. She got herself a Taylor, although her guitar is far less expensive than mine the tonal quality and ease of playing are amazing. Thanks again for checking in Yunier see ya soon. I really enjoyed this article. I didn’t even know what a “luthier” was up until now, but now I can’t wait to read more about it! Glad you liked it Roman. Yea some of these guys/gals have studied under Master Luthiers who’s heritage (or bloodline if you will) reach way back in time. Much like artists and sculptors.